Mothering in a tiny house is rich with opportunities to grow. Because we are crammed into such a small physical space, we have a microscope on our relationships. Patience and peace, please! Sometimes, there is no room for those. The practice is making room. I am mama to Archer – 9 and Ella – almost 11. I married my match. We share an authentic love that has challenged me to live fuller and truer to myself. I practice voluntary simplicity, mindfulness in parenting and mindfulness in education. I teach Kindergarten to a lively bunch of 5 and 6 year-olds at Blue Mountain School, a small contemplative progressive school in the Blue Ridge Mountains. We start every school day in mindfulness circle, then we play guitar together and sing, dance, read and count. I’m grateful to continually study the important things we learn in Kindergarten. Last season I grew and put up enough vegetables to last until this March; now I know I need to expand. Just knowing how big my garden needs to be is huge for me. When I started out, I had no clue what would grow or how much land I’d need to keep my family in vegetables for the year. Every season I learn something to improve my yields and then mother nature changes the game. I’m a continual beginner in the garden which keeps the element of awe and excitement alive. The garden is one of my favorite places to be. 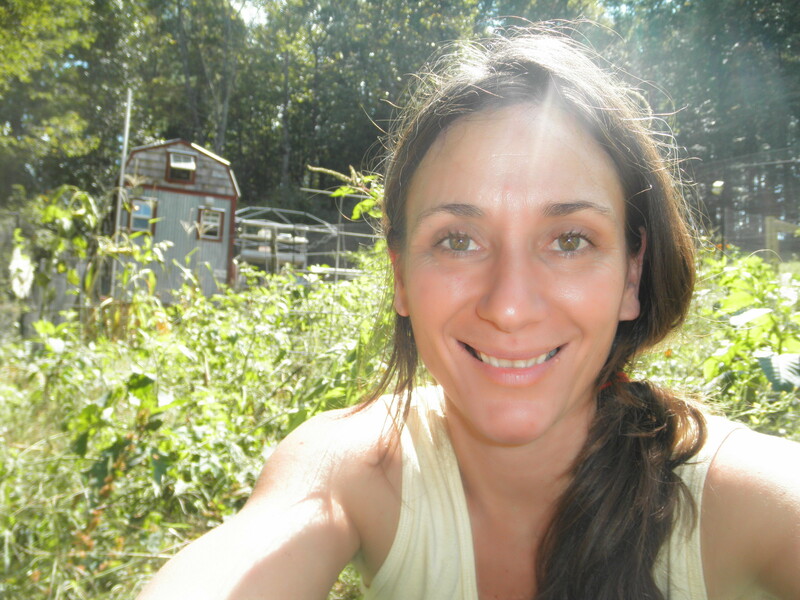 I write about cultivating a richly simple life on our micro-homestead. Our lifestyle is one of conscious choice. We choose to live connected to the land, our food, and each other. We also choose to live a zero-debt lifestyle. We’ve lived in our tiny house since May of 2011. It has allowed us to live mortgage-free while we save for and build our bigger house. The big house is dried in (YES! ), but we are far from moving in. Building as time and the money permit is a slow process, and it’s helped us to cultivate patience and acceptance. My mantra is “slow and steady wins the race,” just like the tortoise in Aesop’s fable, The Tortoise and the Hare. We can learn a lot from a tortoise. Karl is the most creative, hard-working, innovative, funny and loving man I’ve ever met. So I married him on 11-11-2000 after two years of dating. He’s been busy since then. He remodeled our 100-year-old house in Florida, fathered two children, turned an old fast-food restaurant building into a lovely casual-dining restaurant, was a critically acclaimed chef-owner, built a tiny house, built a shed, worked as a handyman, tile man, glass block man and a chef. Now he can add designing and building our 1400 sq. ft. main house to his list of accomplishments. He just finished the roof and windows and is now siding the main house. 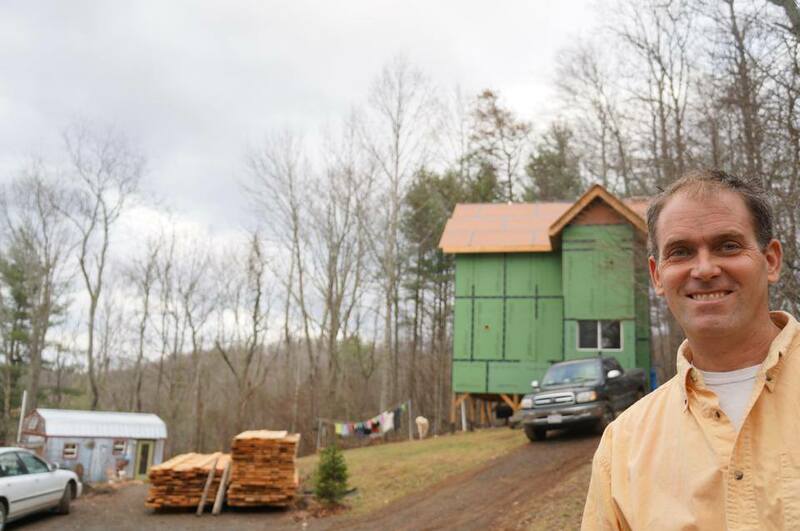 Karl works as a self-employed builder (he’ll build yours!) and handyman. He spends rainy days on the laptop designing building plans. Karl gets things done. I lovingly call him “The Latvian”, because I remember visiting the Coral Castle in Homestead, FL where the tour guides explain how no one ever saw Latvian Ed Leedskalnin carve and erect 1,100 tons of coral rock into a castle. See, Karl is first-generation American: half Latvian and half German. I can only attribute his mysterious way of building a stone walking path in the time it takes me to go to the grocery store to his Latvian/German heritage. He amazes me, inspires me and through example reminds me that I can always do more. They argue and work it out. They love each other. They hate each other. They are the best brother and sister in the world and the worst brother and sister in the world. 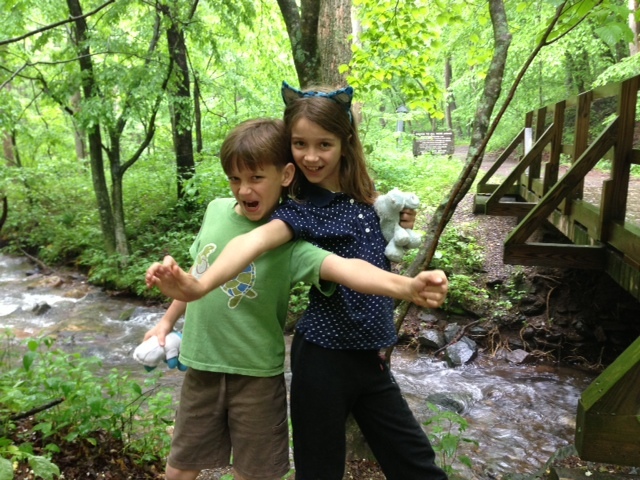 They frolic in the woods and by the creek. They play music and make-up skits. Their favorite TV show is I Love Lucy–watched on library DVDs. They were Lucy and Ricky for Halloween, and our neighbor was Ethel. Entertainment is putting up the tent and bringing the animals inside. I told them the chicken wasn’t a good idea. They cleaned it up. This life in this little house for these formative years has to have shaped them. They are passionate about kindness, acceptance, living out loud, the environment, trees, animals, music, dance, cooking, reading, drawing, writing, making videos and roasting marshmallows. They are nearing adolescence. Moving into the main house will be just in time.